Miss Cindy's Burger Bowls | FoodGaZm.. Recipes Inspired By Travels From East To West.. 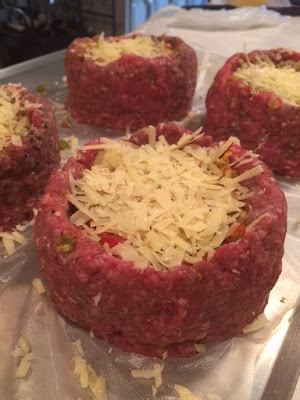 Here's an amazing recipe if you are watching your carbs...turn ground beef patties into edible bowls for a bun-less burger! You can fill them with your favorite things, here I took peppers, shallots, sausage and bacon. It's kind of a different twist to an ordinary hamburger!